Solid majorities of Americans support protecting lesbian, gay, bisexual and transgender (LGBT) people from discrimination in employment, housing and public accommodations. However, that support cannot be taken for granted, as many Americans mistakenly believe that LGBT people are already protected from discrimination. And when opponents of equality introduce false, fear-based attacks on nondiscrimination protections, people can often lose sight of their core values. Talking About Nondiscrimination Protections for LGBT People provides conversation approaches to help build and sustain solid, lasting support for nondiscrimination laws, and also factually and effectively address concerns that might be raised when discussing the need for such laws. Among them: emphasize the values that are at the heart of people’s existing support for nondiscrimination; explain why nondiscrimination protections are important and needed; share stories and model people’s journey toward solid support; and help conflicted audiences think through and calm their own anxieties—all while avoiding missteps that can inadvertently intensify those concerns. Movement Advancement Project and Equality Federation Institute. January 2017. 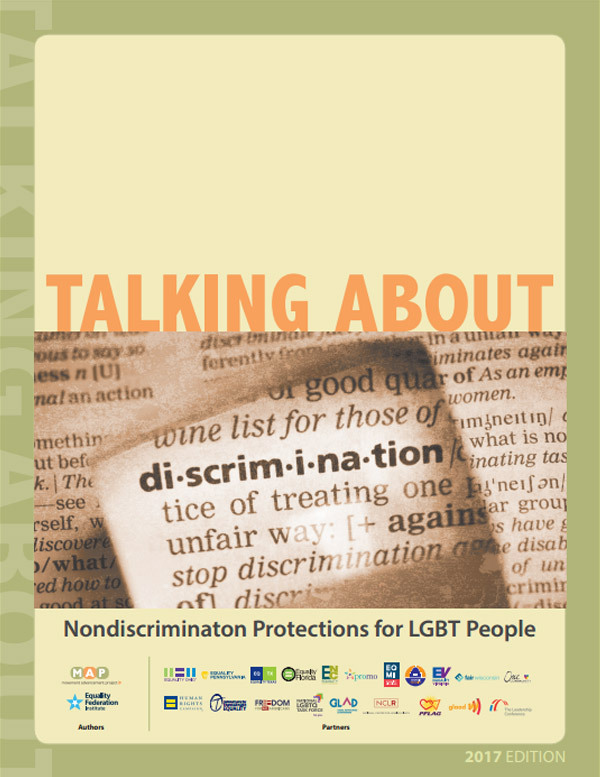 "Talking About Nondiscrimination Protections for LGBT People." 2017 Edition. MAP's Talking About LGBT Issues Series. http://www.lgbtmap.org/talking-about-nondiscrimination-protections-for-lgbt-people (date of access).